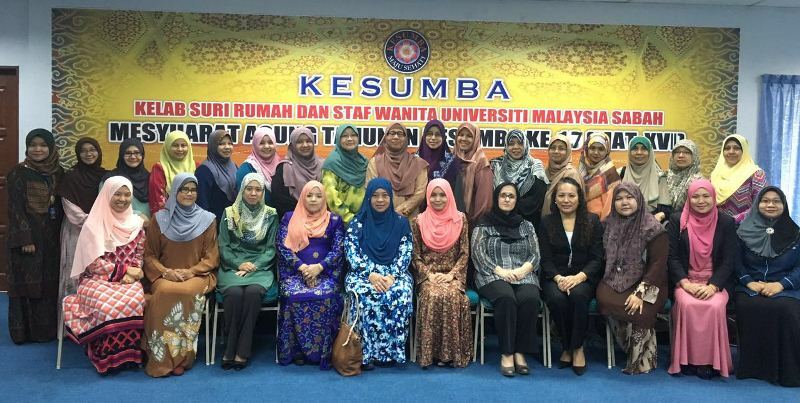 MONDAY, 01 AUGUST – The Housewives and Women’s Association (PUSPANITA), International Islamic University Malaysia (IIUM) paid a courtesy call to the Housewives and Women Staff Club (KESUMBA) of Universiti Malaysia Sabah this morning. The delegation from IIUM was led by the Director of Student Affairs and Development, who is also the Chairman of PUSPANITA IIUM, also known as ‘Nur El-Shams’, Hafsah Mohd Yusoff. The delegation was warmly welcomed by the Exco and members of KESUMBA at Teratak KESUMBA, UMS. Speaking at the gathering, Hafsah expressed their intention to learn more about the activities that KESUMBA had held that benefitted their members, and ways to attract more members among staff to join the association. “Our association was established only two years ago, and so far our members stood at more than 180,” she disclosed.